Most penetrating oils need to be wiped when applied to ipe. 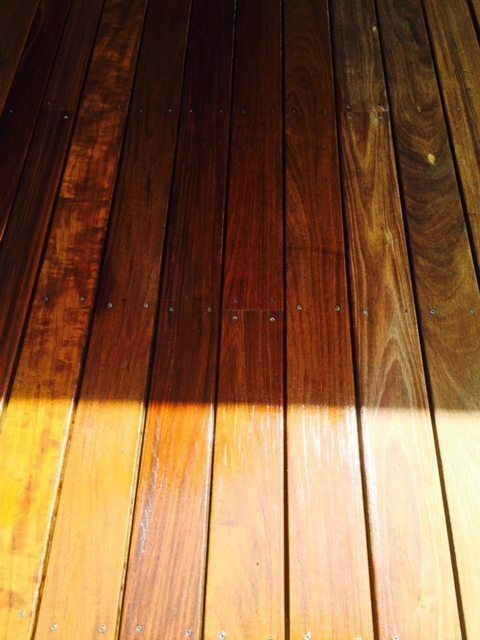 We used Ipe Oil to finish our deck. We did not wipe off enough oil from the wood when we applied it. It now looks shiny and still tacky after three days. Do you think it will harden up? Is there some type of chemical to wipe over and reduce amount of oil built up? This is a common scenario, and tacky oil makes it impossible to enjoy your deck. When people start applying oil on ipe, it looks so great that one would just assume that the ipe will accept the oil like normal wood does. We have recently discovered a couple of oil formulations that don’t need to be wiped, but most do. Great advice. I just applied Ready Seal to a 10yr old Ipe deck that had been through many finishes. I square buff sanded with 80 grit. I experienced a bit of standing Ready Seal a couple of hours after application. I did apply very thick. I wiped off excess with rags. I now have just a few areas that are showing “fish eye” and a bit filmy. I’m going to wipe the whole deck down softly with a mineral spirit soaked in hopes to even out the whole finish and give uniformity. I’ll report results. Thank you !